My wife works at a pre-school. They have events for the kids and sometimes purchase novelty items and decorations concurrent with the theme. There are several vendors that supply these cheap trinkets, baubles and colorful decorations. 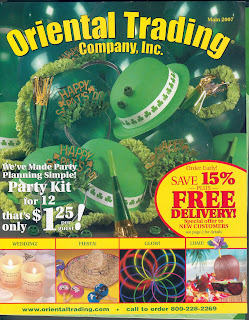 One of those companies is the Oriental Trading Company, Inc.
Once you make a single purchase from them, they fill your mailbox on a bi-weekly basis with their catalog. Usually I toss the thing in the recycling bin, but on a whim, I flipped through the catalog. There was the standard birthday kits, St. Patrick’s Day decorations, balloons, Jesus candy… Jesus candy? The Oriental trading Company obviously knows that religious people like to have parties too. 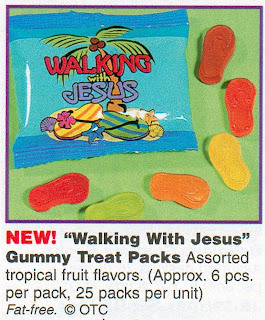 The “Walking With Jesus” Gummy Treat Pack caught my eye. it was then that I turned those footprints into sweet candy goodness, so that you would have a snack during those really awful times." 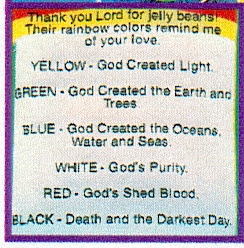 Until I saw the “Colors of Faith” Jelly Bean treat Packet. I thought red was fucked up. Luckily this part of the rainbow reminds me of God’s love. Is it the goal of the candy to make you repent after lunch? Is it a quick snack for the apocalypse? You can’t take it with you, but why not a little treat before the ascension? Imagine a screw up at the factory and getting a whole pack of blacks? Would you just kill yourself right there? What if you don’t like the taste of the white ones? Is that sacrilege? Can you swap “God Created Light” with your friend’s “God’s Purity” and not piss off the Almighty? These things I do not know. What I do know is that I will never be able to eat a black jellybean again without thinking of the four horsemen riding around and locusts. It’s hard to eat candy and think about locusts. I don't think it's a typo or a reference to the Trinity, I think "God's shed blood" just means the blood that God shed. The black ones are pretty messed up. I can't imagine little kids happily munching away on jelly beans that symbolize death. 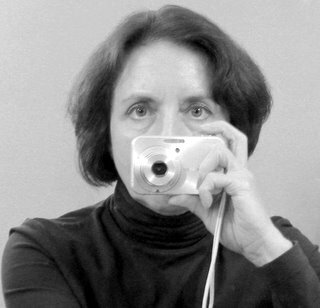 No, I am required to make time to write. I do that in two easy steps. It's easy to find time when you don't spend it doing other important things like cleaning, cooking, going to work, spending time with wife or bathing. I'm writing this three days from now. I'll call you very soon. Like two days ago. Mix ingredients, coat with powdered sugar, Enjoy! Are you kidding? I just posted this on February 17th! I'd lost my faith but you've given me something to believe in. So it's just junk food - it's better than nothing. 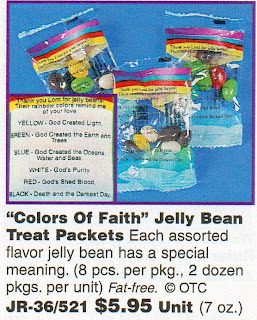 If you flip over to page 57, you'll see that the "Colors of Faith" jellybeans are also being sold as the "Squishy Man Love" jellybeans. Those churches better hope there's no shipping mixup. ...AND they're fat free, so they must be holy. dude, fantastic. 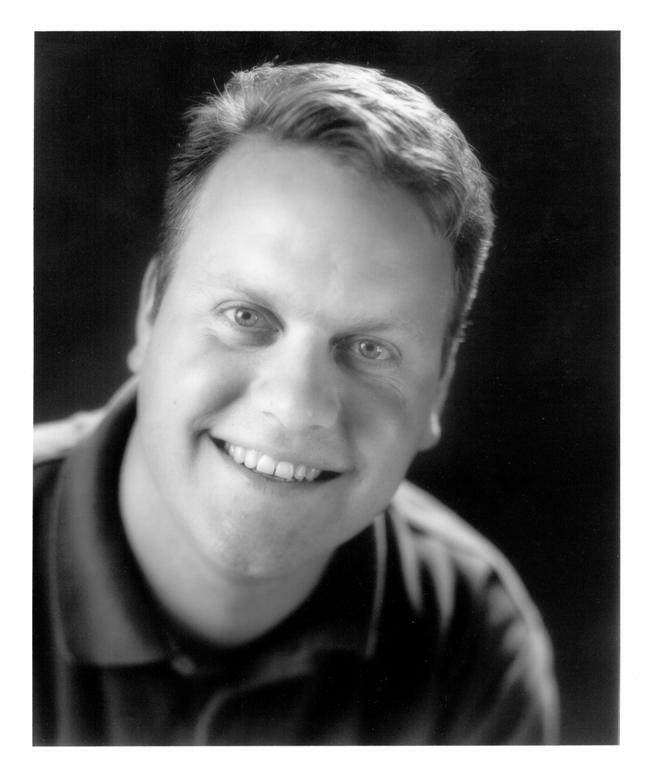 your wit and colorful writing are a breath of fresh air. keep it up. Evidently you're not a christian by the remarks I see. Very sad. I'm sure that Jesus and I both agree that this product is very silly. He told me so!